Ed John and Christy Clark, November 21 2016, presenting the Special Advisor's report in Musqueam. Photo by BC Government. In September of 2015, Grand Chief Ed John was hired by the province of British Columbia “to provide advice on how to address the inordinate number of Indigenous children in care of government.” For clarification, the BC government asked for advice from the Chair of the First Nations Summit on how to stop itself from forcibly removing the children of Indigenous nations. On November 21, 2016, John’s report was released: “Indigenous Resilience, Connectedness and Reunification – From Root Causes to Root Solutions.” Unfortunately, it does not feature the most obvious solution to the problem – the solution proposed over and over by Indigenous leaders; the solution which families and communities have fought for, tooth and nail: the removal of state child-apprehension programs from interference among peoples with whom Canada has no treaty, and over whom Canada has no jurisdiction. Instead, the report calls firstly for increased funding to the provincial Ministry of Child and Family Services, in order to support the presence of more government-accredited social workers in a Ministry office on every reserve. And lastly, for Canada-wide legislation dictating the terms by which Indigenous Peoples may participate in child welfare. There is a vast disconnect between the stories reported and the recommendations ensuing. The stories: anger, heartbreak, loss and irreparable harm caused by all-powerful MCFD agents demanding nuclear-family scenarios from extended-family cultures. The recommendations: nothing less than re-institution of the Indian Agent. The highest recommended level of community engagement is a “nation-to-nation” protocol between the Indigenous party and the MCFD regional office (which is not a nation). After that, in the long term, an Indigenous community can take steps to replace the on-reserve agent with a bureaucrat of their own making, following federal prescriptions for the fulfillment of Ministry requirements. There are several further, eerie shades to this report. One appears in the opening paragraphs, where the late Tl’azt’en warrior Chief, Harry Pierre, is quoted: “In our time, the helpers would come to help the mother and father...they would remind the parents of their responsibility.” Ed John does not refer in his report to any character resembling a “helper,” such as is described by Pierre, except the newly mandated on-reserve social worker. No part of these recommendations pursues Indigenous autonomy in their continuing, unsurrendered jurisdiction over these matters. Although UN declarations are referenced, the report’s recommendations ignore international recognition of Indigenous Peoples’ rights to self-determination, control of their lands and resources and their own natural wealth, and control of their own social, economic and cultural business. A handful of news articles have appeared on the release of this report, all relying entirely on phrases provided by the government and Ed John’s public remarks. 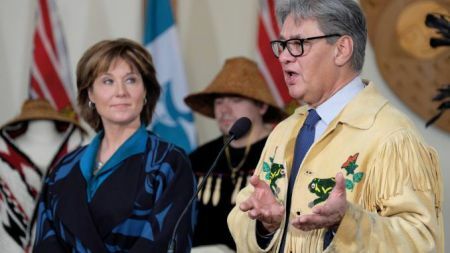 The journalists do not include the hard facts of his main recommendations, but parrot the buzzword jargon which John provided in his summary: “the essence of his 85 recommendations is a call for a jurisdictional transfer of aboriginal child welfare from governments, federal and provincial, to indigenous communities themselves,” reported Vaughn Palmer in The Vancouver Sun. This is an example of the highest expression of “jurisdiction” possible under Ed John’s recommendations. This is a very unimpressive example because it is not entirely true. According to a young Nisga’a woman living in Vancouver, she and her new family have been harassed by MCFD since she was six months pregnant. The Ministry has exacted dreadful invasions of her life, all on pain of losing her infant child if she does not comply. When questioned about assistance available to her as a Nisga’a citizen, who one would expect to have benefit of this “all possible because of the existing relationship between Nisga’a and MCFD,” she explained that this was not considered a good or even viable option by other young Nisga’a families she had asked. This particular young woman is mature, extremely intelligent, capable, and focused on her son – but she made the mistake of reporting to an Aboriginal liaison worker that she had had a fight with her boyfriend. “Jurisdiction” here means perhaps even less. The BC government press release announcing the report also included the news that “Of the recommendations directed at MCFD, work on 40 of them is either being wrapped into the ministry’s multi-year operations plan or is currently underway.” It seems that the report has outlined some extremely achievable goals for the provincial government. Or is that a bad translation too? The report was also described by the province as a key to “improve outcomes for Indigenous children and youth by changing focus from intervention and separation to strengthening families.” However, there are no recommendations pertaining to this at all – except possibly #17, a reminder list of procedural obligations for BC judges, including that they should “make every possible effort to keep siblings together in their orders.” And possibly #37? Another $4 million to INAC and MCFD in “family preservation funding”? • MCFD, with the objective of maximizing its child safety recruitment, review the entry-level qualifications for front-line workers to consider educational and experiential requirements for child safety positions. Of all the grandmothers’ statements and community advocates’ outlines of internal remedy, those are not the characters elevated in the Grand Chief’s recommendations. It is not until Recommendations 5 and 6 that First Nations – or any of them – are mentioned in the proposed new regime: their leaders should meet regularly with regional MCFD officers, and receive lists of the names of their children who are in state care. As this report will illustrate, I do not believe it is sufficient to simply refine the existing child welfare structure and authority base with an internally accountable quality assurance framework premised on greater centralization and improved lines of communication. Nor do I believe it will suffice to simply deploy more university-educated social workers, who – though often well intentioned – are without the knowledge and understanding of the Indigenous peoples with whom they work. A bigger and brighter version of the existing children welfare system will not address the concerns or meet the expectations of those Indigenous peoples with whom I met over the course of my engagements as Special Advisor. And that question is this: did the same person who wrote that statement also write the recommendations? Because the recommendations are all about, are only about, expanding the existing structure; deploying more social workers; and delegating a “refined” version of the existing framework to Indigenous administration. John’s unique commission as “Special Advisor” started two months before his colleague, Bob Plecas, released his commissioned report on the same subject of child welfare. That report is unique in that it attached a dollar figure to the MCFD’s annual operating budget in BC: $2 billion. However, because of a self-disclosed business approach to the matter, when the Plecas Report came out in December, 2015, Indigenous leaders described is as “callous” and “ignorant”, as well as publicly urging John to remove himself from the situation and distance himself from the report. He did neither. The First Nations Summit, the center of John’s career, is the state-constituted body which represents First Nations in BC treaty negotiations. This is not widely regarded as authentic representation of Indigenous peoples, although the BC government has always allowed the lines to blur: “Ed John has no mandate to represent anything. Another Christy Clark scam.” – Morris Amos, Haisla. Entrenched dominance jargon throws shade on the few bright Indigenous-led initiatives that are barely referenced in the Grand Chief’s report. He repeats the "fact" that "the federal government has jurisdiction over Indians..." three times. In order to crack this code language, one must appreciate that whatever the government of Canada recognizes as an Aboriginal right, in this case “self-government” (now defined by the “First Nations Governance Act”), is therefore something that can only be safely exercised in a manner in which Canada approves and recognizes and legislates it. It is simply an act of deception to include the words “self-determination” in a context which precludes the meaning of that right. “period of transition” = implementation of former Prime Minister Harper’s Bill C-45 omnibus legislation which sparked the Idle No More movement in reaction to its sweeping codification of limited and delegated Aboriginal rights, such as in the cutting of Constitutional Non-Derogation clauses; the First Nations Financial Transparency Act; First Nations Governance Act; First Nations Land Management Act; First Nations Education Act; etc. * also implementation of the federal government’s “Secret” (otherwise unnamed) document on adapting federal policy to “reconciliation” following the Supreme Court rulings on Haida and Taku in 2004. The report is a collection of headlines unsupported by corroborating details. This way, a reporter can reference these headlines as if they are representative of the content of his report. Except the black and white recommendations, which do not support the headlines. This is a writing genre that Ed John has perfected over many years of his career in the Indian Industry. John has dispersed empty rhetoric, while never taking any action whatsoever, as the Chair of the First Nations Summit; as BC Minister for Children and Families; as a member of the UN Permanent Forum on Indigenous Issues – in which capacity he often and profoundly misrepresented events in the state of Canada, most notably in his characterization of the Truth and Reconciliation Commission as a product of Indigenous decision. - Into the 1960s, enforced attendance was relaxed and some children did not go to IRS. - In the 1960s and 70s, tens of thousands of Indigenous children were kidnapped from public places, from maternity wards, and from homes by state officials mandated to find neglect and remove children to non-native homes, severed from all knowledge of their true identity. - From the 1970s to present, the state has imposed impossible criteria on Indigenous families to keep their children, with no accountability, apparently, to anyone, and no real recourse for families. The only “deliverable” appears to be the children themselves: out of their communities and into foreign homes. - In 2016, Ed John recommends that the Ministry responsible for half a century of forcible removal of children be located by satellite offices directly inside Indigenous communities, thus rooting government control of family life in the heart of the community. With the option for Indigenous Peoples to eventually run that particular machine themselves, by agreement, and be accountable to Canadian taxpayers. Report of the Special Advisor to BC regarding Aboriginal children in state care. Nov 21 2016.